Chile is a long, narrow country that extends between two great forces of nature: the Pacific Ocean to the west and the high peaks of the Andes to the east. It has a surface area of 756,096 square kilometers. Chile includes Easter Island, in Polynesia, 3,700km from the mainland. The nation and consists of a strip of land 4,200 km long and 90 to 440 km wide. In the far south, the land is transected by hundreds of islands and fiords. Santiago is the country's capital and largest city in terms of population and employment. Santiago is the country's main political, economic, cultural and industrial center. It is the gateway to Chile and one of the most modern capital cities on the continent. In the country's northern region, the altiplano and deserts predominate, including the Atacama Desert, the most arid on the planet. In the central region, the country's two dominant mountain ranges – the Cordillera de la Costa and the Andes – create a series of valleys lined with fast-flowing rivers and an abundance of farm land. The country's southern region is known for its large lakes, evergreen forests and snow-capped volcanoes. The region is also home to important inter-oceanic passages like the Strait of Magellan, the Beagle Canal and the Drake Passage. 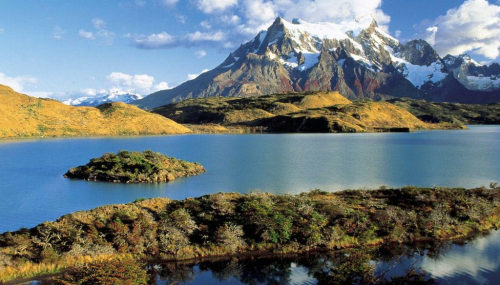 Southern Patagonia is marked by intense cold and strong winds as well as fjords, lakes and raging rivers. The variety is completed by the archipelago of Chiloé, the pristine Juan Fernández Islands, and magical Rapa Nui with its warm subtropical climate. Due to the shape of its territory, Chile possesses 4,000 kilometers of coastline, laden with extensive beaches and towering cliffs hanging over the sea. To the east, and parallel to the Pacific, you'll find the Andes, which feature some of the highest peaks of the entire mountain mass, including Ojos del Salado Volcano, the Llulaillaco Volcano, Tres Cruces and Cerro Tupungato. In Chile's altiplano, inland from Arica, Iquique and Antofagasta, you can explore small towns where the inhabitants still practice the traditions of the Aymara culture. Their daily life is a product of this culture's contact with the Incans and the Spanish conquistadors. Easter Island offers an opportunity to view the mysterious Moai statues and have direct contact with the Rapa Nui culture. The old quarter of the city of Valparaíso has been selected as a UNESCO World Heritage Site. Nineteen percent of the country's territory is a protected park or natural reserve. All of this is accentuated by the more than 500 active volcanoes scattered throughout the territory, part of mountain ranges that crown many of the country's majestic landscapes. Chile debuted in Miss World 1963 and produced three semifinalists in 1967, 1998 and 2000. This year the beautiful and talented Gabriela Pulgar Luco, the official Miss Chile 2011, will represent her nation in Miss World 2011. The Times of Beauty proudly presents Gabriela Pulgar Luco, Miss Chile 2011, in an exclusive interview for our interview series, Meet the Misses. I am Gabriela Pulgar Luco, Chilean; I am 23 years old, and single. I live in the city of Santiago, the capital of Chile. I am studying Phonoaudiology (speech and language therapy) at the Universidad del Desarrollo. I am an active person and multifaceted. I have practiced since childhood sports, but my passion is music. I dream to be a recognized artist. I was born in the port city of Valparaiso, a cultural heritage site of humanity. It is a picturesque town, whose colorful houses climbs hills, which overlook the bay. I grew up in the countryside on the outskirts of Santiago, and after school I moved to the city where I live now. Chile is a country with diverse landscapes and cultures. We have contrasting climates and landscapes and enchant the tourists who visit us: in the north, the desert and the beaches; lakes and lush nature in the south and the majestic mountains and beautiful sea accompany us throughout our nation. Our people are simple, friendly and supportive in adversity. Our internationally recognized products are copper, our wines, and salmon. To me it means an honor to represent the natural beauty of Chilean women, their strength and self-improvement. I have taken this commitment with maturity and responsibility, feeling like an unique development opportunity. I want to be an example for youth. I feel I have an important mission, which is to disclose everything about our beautiful nation in distant lands. Gracias a la Vida by Violeta Parra. I choose this song because it represents how grateful I feel for what I am and for the growth opportunities given to me by my family and the people closest to me. My days pass between college, volleyball training and music. I try to balance my time to do whatever I like. 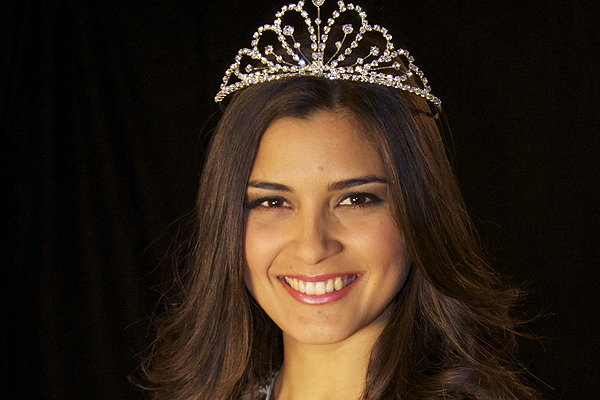 Since I began my reign as Miss Chile, my days have been more intense. My preparation for the Miss World pageant has been very thorough from improving my English, to beauty treatments, photo shoots, interviews and visits to the ASPEC Foundation, whom I support. I see myself as a complete, happy, and fulfilled woman. I see myself as an artist, traveling to different places giving my music with a message of support to children and people with special needs. I admire the poet Gabriela Mistral. She was a woman with a great mission for the education of children. She devoted much of her life to teaching and also to poetry, inspired by powerful emotions and romance. She was a woman with significant achievements: cultural ambassador, consul in Brazil and New York. She received the Nobel Prize for Literature in 1945, becoming an ideological referent for women in Latin America. I have visited countries that I have found attractive, not only for its scenery but for its history and culture. But I love my country and it is where I want to live. My choice is the use of renewable energy, of low environmental and human impact. For example, solar or geothermal are clean energies that do not harm the environment. Nuclear power involves too many risks for the population and the environment. Furthermore, the consequences are disastrous in case of accidents or errors, affecting future generations. The lack of development opportunities for children and young people, by the unequal distribution of resources. Resulting in the violation of their basic rights, such as food, health, housing and education. 11. What are your duties as Miss Chile? My duty is to be a significant reference and example for the youth of my country. Project a positive vision of the country, its people and its tourism potential by promoting its attractions. The most important thing for me is to proactively mobilize people, to gain sympathy and aid commitments. It is an important channel of communication with people. It allows you to generate dialogue on certain important issues, and disseminate opinions and information. It gives the possibility of rapid feedback necessary to enrich myself through advice or suggestions. It means being conscious of our reality, our skills and opportunity to develop. It means living in society, to communicate and help, and have empathy for others. We build humanity in that way. My purpose is to grow and learn from each experience. Surrender to others with joy, living every moment intensely. Personal Goal: Be happy, enjoy what I do and delivering the best of me to others. Dream Destination: To the moon. Favorite Book: “La sombra del viento”, Carlos Ruiz Zafon. Favorite Hobby: Singing and playing guitar, and enjoy with my family and friends. Favorite Sport: Volleyball and jogging.